Nearly 30 years after a process of geopolitical fragmentation in Southeastern Europe, Bulgaria has supported the region’s “Europeanization” to align it closer to the democratic and prosperous European Union, according to Bulgaria’s top envoy to Korea. Bulgaria assumed the presidency of the Council of the European Union in the first half of this year. Sofia has sought to bring the Western Balkans -- which have been riven by past conflict and ethnic and religious division, and generally lag behind most of Europe economically -- into the EU’s fold under the presidency. “Supporting the European perspective for the interconnectivity of the Western Balkans and their integration into the European Union was a strategic priority of our presidency,” Ambassador Petar Andonov said at a reception last week where Bulgarian deputy minister of economy, Lachezar Borisov, participated. Besides EU member Croatia, the Western Balkans comprise Albania, Bosnia and Herzegovina, Kosovo, Montenegro, Macedonia and Serbia. During the presidency that lasted from Jan. 1 through June 30, Bulgaria worked on four priorities. The first was ensuring sustained economic growth and social cohesion by empowering and educating younger generations through initiatives such as the Erasmus Plus program. Secondly, Bulgaria worked to enhance Europe’s security and stability and better manage migration by reforming the European common asylum system, and by improving the interoperability of information systems and databases to better counter terrorism and control borders. Thirdly, the country sought to represent the interests of Western Balkan nations and augment their connectivity with other EU member states encompassing transport, energy, education, security and digital infrastructure. The last priority was paving the way for the digital economy by developing the European Digital Single Market and improving access to innovation and links between learning and employment. Through the Sofia Declaration and Sofia Priority Agenda produced during the EU-Western Balkans Summit in Sofia on May 17, the two sides affirmed their resolve to strengthen cooperation, with Brussels motivating Western Balkan partners to continue their progress in reform, and promising to actively support them on a merit-based approach. Both sides vowed their commitments to investing in broadband connectivity; strengthening cybersecurity, trust and industrial digitalization; fostering the digital economy and society; and boosting research and development on digital infrastructure. On the Western Balkan question, the European Commission says it aims to usher in democratization, free market economic norms, the rule of law and good governance, security and stability, cultural collaboration and interethnic reconciliation, as well as technological innovation and transport, energy, digital, commercial and human connectivity across the region. According to Andonov, one key aspect of the Buglarian presidency was promoting the Digital Europe initiative, including the General Data Protection Regulation, Audio Visual Media Services Directive, European Electronic Communications Code for developing high-speed broadband networks, and European Regulation for Electronic Communication. 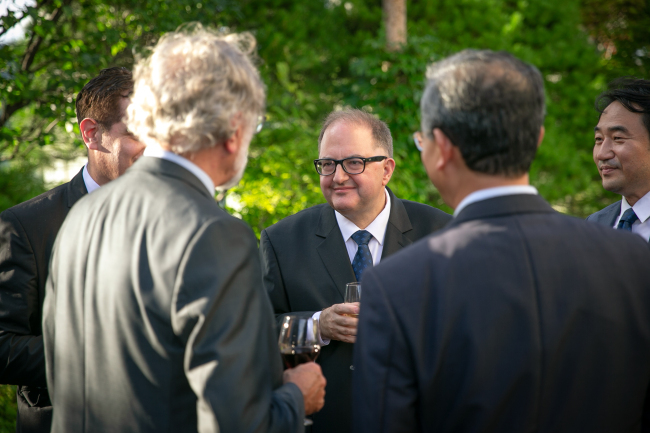 “In creating a socially vibrant and economically interconnected Europe, our presidency bore one important achievement -- the agreement on the Posted Workers Directive in the services sector,” the ambassador said. A “posted worker” is an employee sent by his or her employer to carry out service work in another EU member state on a temporary basis. “Finalizing this extremely difficult and politically sensitive dossier can be seen as one of the biggest successes of our presidency,” he added. On the issue of EU member states’ intake of refugees and asylum seekers, which has existentially divided Europe in recent years, Andonov said the presidency invested energy and effort to reform the Common European Asylum System, particularly focusing on the Dublin Regulation. The regulation is an EU law determining which member state is responsible for examining asylum applications and providing international protection. It aims to prevent an applicant from submitting applications in multiple member states, and also reduce the number of “orbiting” asylum seekers that are shuttled from one member state to another. The country in which a migrant first applies for asylum is responsible for either accepting or rejecting the claim, and the seeker may not restart the process in another jurisdiction. At the latest European Council meeting in Brussels on June 28-29, the envoy explained, the member states agreed on the need for a common approach, encompassing the reinforcement of a European border, mobilization of funds for addressing the migration’s root causes, and consideration of different scenarios for cooperating regionally on disembarkation. On the economic front, Bulgaria concentrated its efforts on ongoing and future negotiations on free trade agreements with the EU’s key partners, including Japan, Singapore, Vietnam, Indonesia, Mexico and Mercosur, as well as Australia and New Zealand.